Use the clean reusable energy to protect the environment. Solar technology allows you to save energy while getting the brightness you need to stay safe at your home. Our products are built with motion sensors, LED light gets brighter when it senses motion, lighting up your path at night, alerting you to any activity outside of your home, and deterring potential criminals. Made with 36 individual LED lights, this security system is built with a wide angle to give you maximum visibility, and all while saving electricity too! Easy way to installing the security light, just use the included anchors and screws and they'll be set in couple of minutes. Have questions? Simply refer to our included owner manual. Clean reusable energy to light up your home: Innovative technology allows you to use solar energy to power this bright sensor light. It's a great way to illuminate areas of your home while saving electricity! 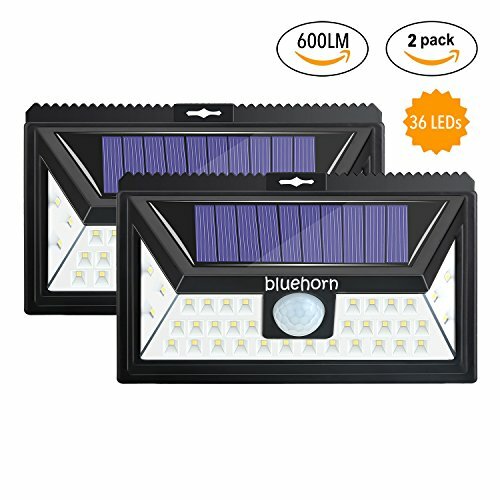 36 BRIGHT LED LIGHTS: More LED lights than most solar-powered security systems, it comes with 36 individual lights to give you the brightness you need to see at night and to deter criminals. Easy installation: Installation is super easy and can be done just in minutes. No wires or adapters needed! It's a great outdoor light for your garden, yard, aisle, porch, patio or driveway! If you have any questions about this product by bluehorn, contact us by completing and submitting the form below. If you are looking for a specif part number, please include it with your message.